Consultancy PwC, the world’s second largest multinational professional services network has published an updated edition of The World in 2050. In the latest edition, The World in 2050: Will the shift in global economic power continue?, the authors present economic growth projections for 32 of the largest economies in the world, accounting for around 84% of global GDP. “We project the world economy to grow at an average of just over 3% per annum in the period 2014 – 50, doubling in size by 2037 and nearly tripling by 2050. But we expect a slowdown in global growth after 2020, as the rate of expansion in China and some other major emerging economies moderates to a more sustainable long-term rate, and as working age population growth slows in many large economies. The global economic power shift away from the established advanced economies in North America, Western Europe and Japan will continue over the next 35 years. 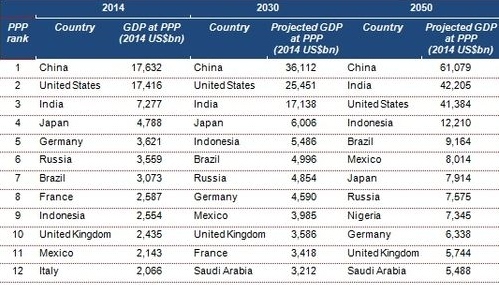 China has already overtaken the US in 2014 to become the largest economy in purchasing power parity (PPP) terms. In market exchange rate (MER) terms, we project China to overtake the US in 2028 despite its projected growth slowdown. A summary table in the PwC report shows the firm’s predictions for major economies in 2050 have Mexico continuing to progress up the world ladder, with its economy reaching world rank #6 by 2050, ahead of Japan, Russia, Nigeria and Germany. Would you guys happen to have a list/map of cities in Mexico that have a population larger than ~500,000 people?